The purpose of this application is to allow interested parties to estimate Minnesota intrastate experience modifications. This program is not intended to cover all the rules and exceptions found in the Experience Rating Plan Manual, and cannot create a final experience modification worksheet. 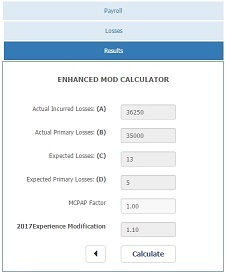 It does, however, calculate experience modifications based on the payroll and actual loss information you provide. This application also allows for the calculation of "what if" scenarios by giving you the ability to adjust this information.